Tomorrow night is the SFWA Nebula Awards ceremony where the Andre Norton Award will be announced. Only half of the nominees are able to be present (six out of twelve is a pretty good turnout), but it’s definitely going to be a night for me…in particular…to remember. For now, I have one last day of being the shiny, almost-got-it nominee…and I’m living it up in style. I’m also talking about this experience–and my personal relationship to the Andre Norton Award on the USA Today’s Happy Ever After site today. I encourage you all to check it out (if you haven’t already)…and keep your fingers crossed for me for tomorrow night! I don’t really get nervous speaking in front of crowds anymore. Public speaking is one of those skills that can be exceptionally difficult to learn, but well worth braving that initial terror to get to the other side. The biggest benefit is that when someone in an organization is forced to find people who will shamelessly stand up in front of a crowd, your name is easily at the top of the list. I can’t tell you how many times I’ve entertained a room full of people at the drop of a hat when a speaker or guest of honor is late or forced to cancel. Stretching your improv muscle is important. Warming up crowds can be a really great game. Telling stories is fun! And yet, the moment I was asked to present the 2012 Andre Norton Award for Young Adult Science Fiction and Fantasy, I was both honored to my toes and scared to death. This should not have been a big deal. Two minutes on stage in front of a bunch of people I know and love. The spotlight wouldn’t even be on me, it would be on the well-deserved recipient. So why was I freaking out? Because this time, it was personal. How on earth was I supposed to sum up what Miss Andre meant to me in two minutes…or less? (A tired audience wants you to announce the award and get your behind off the stage tout suite.) I wasn’t sure it was possible. I only knew Miss Andre for the last few years of her life, but it was one of the most important and valuable friendships I’ve ever had. I wrote in her library, High Hallack. I listened to her stories and her advice. We rolled around in desk chairs and laughed while she read aloud from a book of crazy answers kids had submitted on tests. I enabled her book habit by sneaking her new-release catalogs, even after her personal assistant asked me to stop. It was a friendship that never would have happened if David Drake hadn’t ordered me to go visit her, and I hadn’t been brave enough to write her that first letter. Miss Andre and I talked about writing, but we never really talked about her published work specifically. She loved being a librarian above everything else. She didn’t know what to do with an adoring fan, but she knew exactly what to do with a budding young writer in need of guidance and a place to work. The last time I saw Miss Andre was in 2004 when she sold off High Hallack, piece by piece, to fund the Andre Norton Award. I missed the official sale day, but she still encouraged me to come by and personally helped me sift through the aftermath. It was heart-wrenching. The empty shelves looked like a war zone, but a good chunk of the research library was intact. We spent hours putting together four huge boxes of books (one of which turned out to be my most prized possession…but I didn’t discover that until years later). She sent me a Chinese New Year card in February of 2005 (Miss Andre had cards for every occasion), telling me that the benefit anthology project I was working on was a worthy cause. When she died that March, I was in the middle of a book expo and someone mentioned the news to me off hand. I cried for twenty-four hours straight. The first official Andre Norton Award was presented to Holly Black in 2006. HOW WAS I SUPPOSED TO FIT ALL OF THIS IN TWO MINUTES?!? I lost a lot of sleep. I shared my anxieties with my lovely and patient Nebula weekend roommate, Kate Baker. I wrote down some thoughts on a hotel pad and managed to whittle my presentation down to six sentences. It still felt too long. Kate read it over for me and gave it her blessing. I practiced presenting the award out loud, over and over, while donning my glittery dress for the ceremony. There were bets as to whether or not I was going to cry on stage. Kate told me it was all right if I did. Rose Fox gave me a handkerchief, just in case. I congratulated Neil Gaiman in passing, as he walked off the stage and I walked on. My legs shook like crazy and I steadied myself on the podium, holding Rose’s handkerchief in a white-knuckled grip. I had written down my six sentences, but I didn’t need them. I remembered to breathe. I spoke loudly and slowly. When I thought I would choke, Connie Willis nodded and gave me courage. When I came to the end, my voice wavered, but I did not cry. And when I announced that the award went to Delia Sherman I smiled in earnest, for her name was the one I had been practicing out loud in the hotel room. My mother always called Miss Andre my guardian angel. I remember she had a star framed on the wall, just opposite the door of the library, one of those fancy documents from the Star Registry indicating the celestial body that someone had named after her. Regardless of whether that star is recognized by any professional astronomical organization, I know Andre Norton is up there. I am 100% sure she was shining down on me that night. I only hope I did her proud. For me, the best thing about those six sentences is that it got people talking about Miss Andre and the Norton Award. I swapped some great stories that night with SF luminaries I’ve admired my whole life. As far as I’m concerned, this award cannot have enough praise or visibility. I encourage you all to spread the word about the Andre Norton Award to your friends, teachers, and librarians. Especially the librarians. For the past two weeks, members of the Science Fiction & Fantasy Writers of America have been blogging about the Andre Norton Award–its origins, its importance, and recent books worthy of the accolade. I’m honored to be the final essay in the tour…but I’m not sure I can convey the sheer importance of this award in one blog post, even though I was allowed far more than two minutes and six sentences this time. What can I say? It’s personal. Click here for a complete list of past Andre Norton Award recipients and nominees. 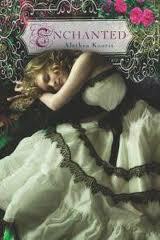 Yes, my debut fairy tale novel Enchanted is eligible for the 2013 Andre Norton Award. Click here to find out more about Enchanted. I’m not eligible for this yet. But I will be, someday… It’s a dream I have. LOS ANGELES – The jury for the Andre Norton Award for Young Adult Science Fiction and Fantasy is actively reading works published in 2010. The 2010 Norton Award jury members is chaired by Sherwood Smith. Publishers and authors may contact nebulanortonjury@sfwa.org for submission information. The Andre Norton Award for an outstanding young adult science fiction or fantasy book was established in 2006 by Science Fiction & Fantasy Writers of America. The award is named in honor of the late Andre Norton, a SFWA Grand Master and author of more than 100 novels, many of them for young adult readers. Norton’s work has influenced generations of young people, creating new fans of the fantasy and science fiction genres and setting the standard for excellence in fantasy writing. Any book published as a young adult science fiction/fantasy novel is eligible, including graphic novels with no limit on word length. Since its inception, SFWA® has grown in numbers and influence until it is now widely recognized as one of the most effective non-profit writers’ organizations in existence, boasting a membership of approximately 1,700 science fiction and fantasy writers as well as artists, editors and allied professionals. Each year the organization presents the prestigious Nebula Awards® for the year’s best literary and dramatic works of speculative fiction.